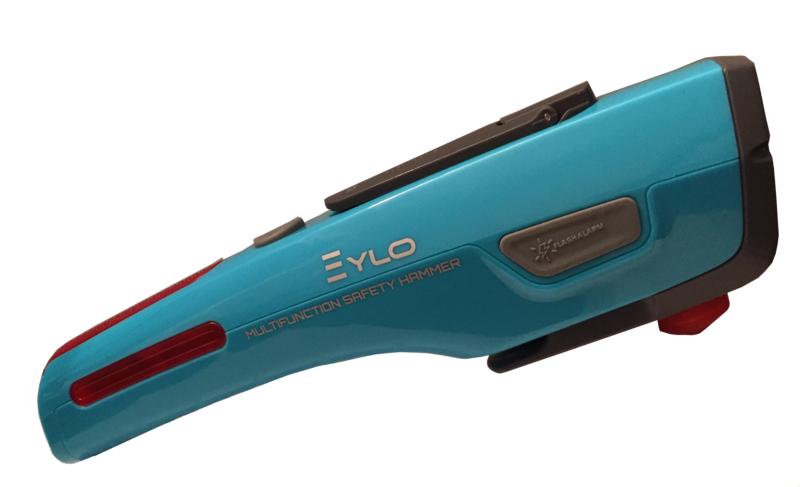 I just got this must have EYLO multifunction safety hammer and I must say I feel like every car should have one of these. It has several functions (please see video for a look at what the tool looks like and where each function is located). First and foremost it is a safety hammer, so if you are stuck in your vehicle (maybe you crash into water and need to get out fast) hit your window or windshield with the bottom party of this hammer and it will shatter the window. Also in this scenario it has a seat belt cutter in it under the bottom that you can slide your seat belt into to cut it off in seconds. So the safety functions on this are awesome. However, EYLO makes this a tool that you can actually use on a daily basis by adding a flashlight function, another great thing to have in a car if you get stranded somewhere. It even has a safety light that flashes red and a magnet so you can put this on the back of your car to signal for help. It also has outputs that you can charge USB devices with. So if you get stuck somewhere, don’t have a charger, you can charge your phone to make a call. This tool really has it all and it’s a must have for any car owner. I feel much more secure with this in my car. MUST HAVE SURVIVAL TOOL – Your Dad or Husband Will LOVE IT! NO BATTERIES NEEDED – LED Flashlight / USB Charging Port / Manual Hand Cranking Charging System! MUST HAVE FOR POWER OUTAGES – PEACE OF MIND Knowing You Can Trust EYLO in Case of an Emergency. CLICK ADD TO CART NOW TO BUY!! 60 DAY MONEY BACK GUARANTEE!!! !